Today was the last farm share pick up. As with last week, I got the full share because my sister-in-law is overwhelmed. The leaves have been falling and the entire walk to the shelter where the produce gets picked up was all crunchy and red, with no dirt path left, just leaves everywhere. It was so beautiful! 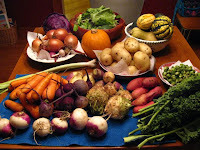 Beets, turnips, rutabagas, celeriac, carrots, sweet potatoes, white potatoes, 5 squash (all different), onions, garlic, leeks, brussel sprouts, kale, pumpkin, lettuce, arugula, tat soi, and the last of the escarole. We're going to miss the farm. Wow. This is inspiring. Next year I will plant more late-harvest vegetables. Gardening season is coming to an end. The break is well deserved.